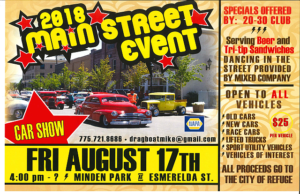 For the 6th year in a row Mixed Company will be the featured entertainment for the Main Street Event show and shine in Minden. Once again we will set up right in the street at the corner of Esmeralda and 4th, just outside the Corner Bar, to provide the official tunes for this long running car show. This is the 30th Annual Main Street Event. So come on down on Friday, August 17th. The event starts at 4pm and we will be firing it up about 5:30 or 6 and play until they open the street back up and force us to move our stuff. Be sure you come by and say hi. Keith, Mixed Company guitarist/singer, has got a busy schedule this summer with various projects going. Saturday, June 23rd he is playing a few songs for a diabetes research fundraiser in Virginia City. There will be about a dozen artists participating so it will be a non-stop showcase of talent. The show starts at 6pm at the Red Dog Saloon and if you haven’t been there before you owe it to yourself to drop by just to check it out. The history of this place is quite a story. But the real reason is to donate to a wonderful cause. Admission is free. Then the following Saturday he will be participating in another Diabetes research fundraiser. This one is in Carson City at A to Zen on North Carson Street. The only thrift store that I’m aware of that doubles as a music venue. Many of the same artists from the show in Virginia City will be there but there will also be a few who are playing this show only. Again, the show starts at 6pm and admission is completely free. But please make a donation to help find a cure for this devastating disease. Of course Keith’s day doesn’t end there. Immediately following his performance at A to Zen he will head down the street to Living the Good Life Bistro and Lounge to play with Mixed Company from 8:30pm to 12:30am. So be sure you drop by after attending the Diabetes fundraiser and dance the night away. Friday June 6th Keith will be playing a solo gig at Bella Vita Bistro located at the Carson Mall. Music starts at 6pm and goes til whenever. So come on down, grab a great dinner then stick around and sing along, or just tap your foot if that’s what make you happy, we don’t judge. Keith will also be joining Just for Fun for the Summer Concert Series on the outdoor stage at Carson City’s McFadden Plaza. This great, family friendly series of events is brought to you by the businesses surrounding the plaza, the Fox Brewpub, Mom & Pop’s, Scoups, and Bella Fiore Wine, every Friday night in July and August. Just for Fun will be playing July 20th and August 10th. [The August 10th show has been canceled. Apparently the stage was double booked that day.] Bring your family and friends and join the fun. And Finally, Mixed Company will return for the 6th year in a row to the Main Street Show and Shine on Esmeralda Ave in Minden. We will once again set up right in the street outside the Corner Bar and provide the jams while you look at the all the cool cars, enjoy the food, the beer or other beverage, and dance in the street. August 17 at 5pm. We’ll probably crank it up about 5:30 or 6. So, as you can see, there is plenty of opportunity to party with Keith as well as the rest of the band. Hope to see ya there. Mixed Company will be returning to Living the Good Life in Carson City on Saturday, June 30th from 8:30pm to 12:30am. This place has great food and awesome bartenders, and we’re bringing the jams. So be sure you bring your appetite, your party attitude and your dancing shoes. It’s gonna be FUN!!! Mixed Company takes the stage at Living the Good Life in Carson City on April 7, 2018 at 8:30 pm. Bring your friends and your dancing shoes. Come early and bring your appetite as Living the Good Life has really good food. Keith Alan Barnett will play a solo show at A to Zen in Carson City on September 9th. Admission is only $5 and gets you a $5 voucher for use in the store. Flight 9-15-17 for the last time. Over the years we have played Flight Restaurant and Bar in Minden more than anyplace else. Flight announced a few weeks ago that they have lost their lease at their current location and will be shutting down as of September 30, 2017. At the same time they announced that, while Flight will be no more, they will be opening a new location in South Carson City called Bella Vita Bistro and Catering, so you will still be able to find the exceptional food they are known for. As of this writing we have not heard what the plans are for live music. But for now, before Flight closes it’s doors, we will be playing there one last time, Friday, September 15, 2017. Please join us in sending Flight out with a party thanking them for being the venue they have always been. One that has fully supported live music in Carson Valley. Mixed Company is proud to announce that, for the 5th year in a row, we will be the featured entertainment for the Main Street Show and Shine car show on August 18th. 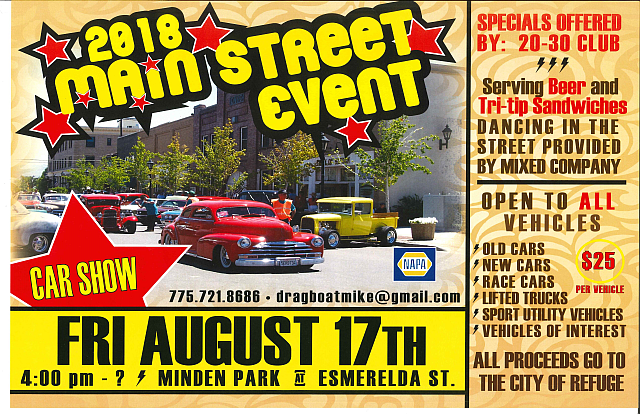 We will once again be playing right in the street at the corner of Esmeralda and 4th Street, right outside the Corner Bar, in the Heart of Minden. So come on out and see decades worth of terrific automobiles, grab some food either on the street or at one of the many area restaurants, get yourself something to drink and dance the night away. Don’t miss Minden Meat & Deli’s 3rd annual Beer Fest Saturday, June 24th from 1 to 6 pm. There will be live music all day with Mixed Company closing it out. There will be a large number of brewers/beers (150+ beers) represented and available for unlimited responsible tasting for the price of admission. Contact Minden meat & Deli in Minden, Nevada (775-883-9999) for tickets. There also are a limited number of VIP tickets available which provide for entry ahead of the general public at noon. Mixed Company will play starting around 3 pm. If you live in Carson Valley be sure to come to Lampe Park after the parade. Mixed Company will be playing from 12:30 to 3:30 pm. While your kids are riding the rides you can grab a cool beverage and enjoy some great rock and country classics as well as a few newer tunes. And a few originals too! Mixed Company Singer/Guitar Player, Keith Alan Barnett, will play a solo set on Saturday May 13 from 11 am to 12 noon to benefit Sierra Therapeutic Equestrian Program (STEP). This benefit will be held in the parking lot of the shopping center located on Jeanell Dr, just one block off of Winnie Lane West of Carson Street. Stay tuned for more info. FanGirl on Welcome to our new website!